DURAKOLOR : Durakolor Colour Coated Roofing Sheets comes from the house of Exodus Ispat Pvt Ltd.Practically there has been no invention in Roofing for many years and least “Roofing Solution” support is available to consumers. Moreover very few people know the ‘Best Practices’ in roofing solution so as to enhance the roof life and offer ‘value for money’ to the consumers. Growing income and changing industrial scenario in the country has made people aspire for better products in life. Durakolor range of products and services cater perfectly to these needs. The colour coated products is available in different profiles, which are ideal for application in both roof & wall, suited both for industrial and residential application. 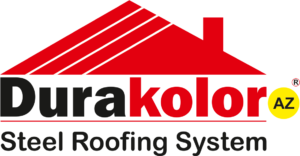 Durakolor and its support team is dedicated to ensure that the customer is offered the best product and services in roofing hence – Better value for money. It is because of our focus on quality and the way we serve our customers we have been able to receive the patronage of customers like the Indian Railways. Our products have found its application in various industries, ranging from Steel, Cement, Packaging, Plastics, Warehousing & Housing (Residence) etc.Click here for more..